A color printer serves many functions for shooters. You can reprint web articles, output load data, print range maps, and even produce your own colored Shooting Targets. Inkjet color printers are inexpensive to purchase. However, the price of factory OEM ink cartridges can quickly bust your budget. Our Epson C60 printer cost under $100.00, but a pair of Epson-brand ink cartridges (one for black and a second for color) runs nearly $60.00! Here’s a solution. For as little as $3.00 per cartridge, InkQuik.com offers 100% compatible replacement cartridges for all popular inkjet printers. We recently purchased Six (6) cartridges for under $25.00 total cost delivered. That’s six cartridges for less than the cost of a single Epson-brand black ink cartridge. InkQuik.com also offers regular OEM cartridges for less than you’d pay at most retail outlets. Oregon-based InkQuik.com promises rapid delivery. We ordered our cartridges on a Wednesday and they arrived in California two days later in Friday’s mail. That’s fast! The cartridges worked perfectly. There were no software or hardware glitches — the printer recognized the InkQuik cartridges as the “real deal.” The ink quality is as good or better than the factory product. We had zero problems, but if you do, InkQuik.com offers a 30-day, no questions-asked guarantee. 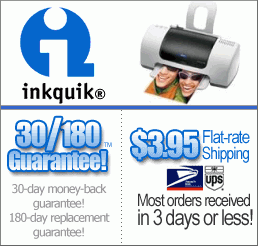 Using InkQuik replacement cartridges can easily save you $100.00 or more annually on printing supplies. We recommend this service for anyone who uses inkjet printers. CLICK HERE to read other customer reviews. Share the post "Good Discount Ink Cartridge Source"